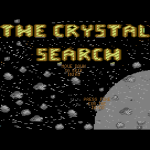 The Crystal Search was a game written by Iain Black of Zzap64.co.uk fame. It was recently brought to our attention by Hedning after a Genesis Project crack was made. "My first game!! Well it would have been if I ever finished it. I started to code the title screen for the game and then I started the actually game, but after a while I decided to code an intro for the game first. The result of all this changing is a half finished intro and a very incomplete game. The intro was meant to have the scrolling stars screen (which is there) with a ship flying across it, which then crashed into a planet with the ship’s power crystals spread all around the planet. The aim of the game was then.. guess…, to collect all the crystals and repair your ship!! P.S. Make sure you keep the fire button held down for a while to see the intro. […] The game is actually in a sort of playable state. 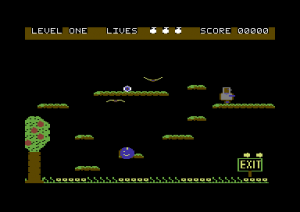 In that you can move the ball with a joy in port 2, jump by pressing up and using the fire button to fire a flame thing. There’s no character collision or anyway of completing the level, but the baddies do move. 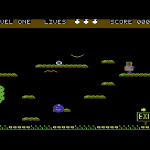 Move to far to the right of the screen and your ball disappears back to the left, the sprite going over 255 pixels wasn’t yet implemented either. 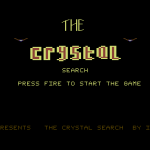 The title screen for the game isn’t actually too bad considering I didn’t know anything about rasters and smooth scrolling back then. The animation of the main character is a little dodgy but all things considered it’s not all that bad." This seems to be all that was ever produced for the game, before Iain moved onto pastures new. Worth checking out as a piece of history. We wonder who it may have been pitched to if competed further.